Solo therapists and multi-site group practices in speech, physical, occupational therapy, behavioral and nutritional health seeking secure, HIPAA/HITECH compliant practice management solution. 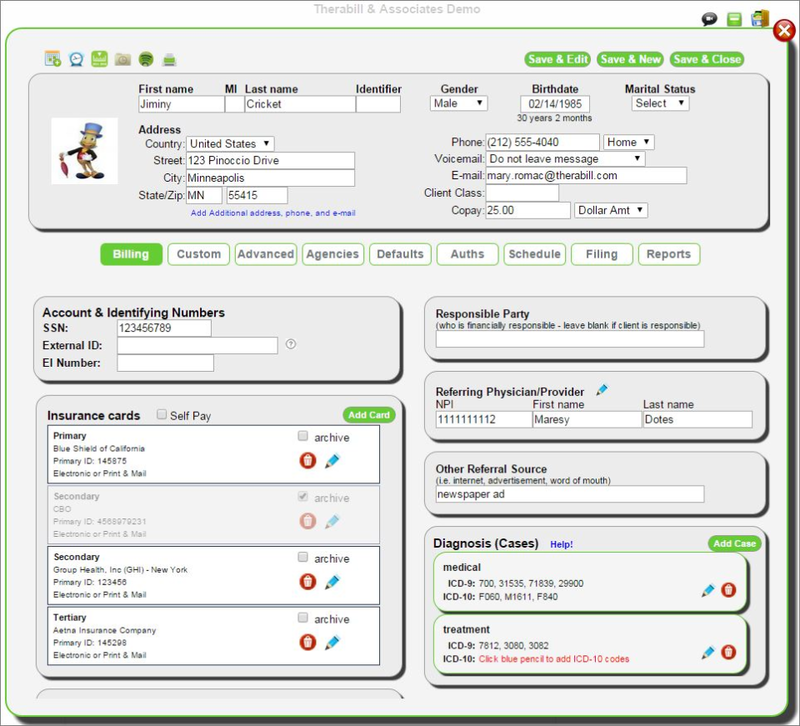 Therabill is a web-based billing software for physical, occupational, and speech therapists. It seamlessly integrates with the WebPT EMR, so documentation and billing work in perfect tandem. 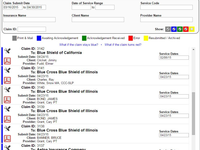 Features include secure documentation with custom templates and flowsheets; in-system emailing and faxing; analytical reporting; scheduling and automatic appointment reminders; and flexible billing with automatic claim scrubbing, no clearinghouse fees, and unlimited claim submissions to thousands of payers. Pros: Great customer support, Very detailed program, meets all my needs, love the section where we can send our bills back to the invoicing area, Fast turn around with payments from ins. companies, I like being able to re-activate clients if I need to, the recurring clients section in a must, automatic insurance card from the state is very helpful. Cons: I would say I do not use all the features on the site but that is only because I don't need them at this point. Overall: I was so relieved to find Therabill. I tried the state's free system and found it complicated and lacking with some services I wanted. I have also used other online billing services that were often flawed and had terrible customer support. I LOVE the ease of Therabill and the excellent support I receive if I ever have a question or issue. Which is very infrequent due to the detailed FAQ section. I really appreciate that the site is always changing and expanding to meet our needs. I know a lot of care and work are put in to maintaining it's success. This site has everything I could ask for in a billing system and so much more. I can get my billing done in a matter or minutes. I recommend Therabill to anyone who is doing their own billing or as a company. It is well worth the small monthly fee! I agree with the what you say about the "credit card title". I am going to make the credit card title a non-required field soon. However, here is a brief explanation of what it is. It is really just a way for you to title the insurance card in any way you want. Think of it is a free style note. The title is displayed to you when you go to create an insurance claim, therefore, you can put anything in it that will help you at that point. The main reason behind it is because sometimes an insurance company may accept electronic claims through a third party (with a different name). For example, the insurance company name on the physical insurance card you receive from the client might be "Acme Insurance". But they accept claims through "XYZ Corporation". You would have to choose XYZ Corporation as the insurance company (who to route the claim to), but you could title it "XZY Corporation" to match what is on the insurance card. Comments: I have been a user of this tool for over 2 years, all has been very good, lots of features, lots of good templates, and pretty easy to set up and use. However, our practice is in Phoenix AZ, and this tool does not support Phoenix AZ timezone for Google Calendar. I have submitted over 6 bug reports, but I have not received a satisfactory response. Different customer supports personnel goes down the same path (make sure your google calendar is in the correct timezone. ), but they tag the bug fixed, and then go unresponsive. I have given up, and will not be using this feature. It is too bad, because our patients do like receiving reminder emails, however until this bug is fixed, we cannot send them reminders, nor can we populate our therapists' Google calendars with their appointments. Comments: We really like this software, it has been a great improvement for us and we are anxious to see the new additions when they are ready to be installed. Pros: The color coding is surprisingly not only appealing but very efficient and 'self-sense' rewarding. Our therapists really like the ability to communicate securely with clients through the patient portal. The ability to process payments (especially credit cards) within the system has been a huge time saver. Cons: We would like to see more options for our administrators to customize some layouts and reports, would like to see the option to search clients more easily, and move the tab "select therapists" from the bottom corner (it is very hard to get to sometimes). We would like to see a more user specific way to communicate between administrators and therapists and clients. Would have been nice to have a more easy system to migrate our (then) current clients into this new system. Comments: We have 10 clinicians and this software is great. it is very easy to use and learn. The billing features work well but for a large organization would not be robust enough. There are pelnty of training videos that are very helpful. Customer service is easy to reach and all but one of my interactions have been great. The one incident they fell short on was when the software was not displaying part of the progress note. It took me almost a month and many calls to finally get someone to deal with the issue. All other issues have been dealt with quickly, however. They do regular maintenance updates which are communicated well in advance and or done during off-peak hours (1am Sat am). Overall its a great platform. Pros: Very intuitive, adequate customization, lots of training videos, reachable/live customer support, easy to learn. Cons: Could be more customizable, billing features are not as robust for larger practices, wish there was a better way to track disbursements to clinicians i.e. better payroll feature. Comments: I am a single practitioner in private practice and I have been using this program for about a year since going into private practice for myself. I have used different electronic medical records programs with past employers and had never had to bill for myself (that was handled by billers). The program integrates billing and scheduling and easily keeps tracks of all payments and client accounts in which you can do yourself. I really like using the document builder - it is quick and easy (and you can edit whenever needed). They provide great tutorials as well as written instructions. The support staff quickly answer your inquiries and help you until you are satisfied (within the means of the program). The great thing too - it has never been down when I have signed in (at all different hours of the day/week). Overall, of all the programs I have had trials or have used extensively, this one has been the best. Some may bulk at the monthly cost but when you compare the different programs, their features, etc... if you are looking for something which you can schedule, bill within a few clicks, keep accounting, do your documentation, the cost is worth it. The only cons I have seen are related to my own personal preferences regarding statements and documents (i.e. formatting). However, what they do have is more than sufficient and easy to use and are "my" forms. I would recommend this to any private practitioner who is wanting to do things on their own without all the overhead costs - money you work so hard to earn. FYI - I am not affiliated with this company whatsoever and truly am attesting to my own experience and use. Pros: - Amazing that a lot of the work is done for you and system is already in place and automatically populates all the info you need, and with just the click of a button you can bill out your claims. Overall: It's a wonderful resource however requires a great deal of practice and guidance on how to navigate the steps of billing and understanding the what and why of what I'm doing. Pros: It gives you a lot of options to run reports, credit card integration, great dashboard. Great price for everything the software does. Cons: Patient portal doesn't allow intake paperwork. You can filter by your clients (so you only see your clients), however if it is a group practice all other therapists can see all your clients. Pros: Ease of use and learning is great. The billing is easy to send to healthcare organizations. Customer service is always polite and helpful. Cons: Some of the ease of moving to one section to another could be better integrated with each section. Also, have issues with the scheduler saving appointments at times. Time consuming having to go into each session billed to check the ICD10 before billing each session. Therabill seems to have more issues with lag time since the new upgrade. Recommendations to other buyers: Ease of billing to healthcare organizations is great, once you get done correcting the claim with the ICD10 code. The ERA section is very easy to use. I like the ease of use of the dashboard and the easy access to videos on You Tube. The customer service is always friendly and helpful. Pros: We love our experience with Therabill. New features and updates are always rolling out that enhance the billing, scheduling, and practice management experience. The custom reports feature is crucial for our practice for payroll purposes. 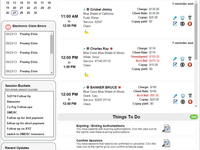 Billing is a breeze and we also love the integrated ERA feature! Cons: The only negative we could think of is the frequency of feature updates, which is not a bad thing, but that something is a bit different every week or so. It is easy to adjust to the changes, however, and use of them are well documented by the vendor. Recommendations to other buyers: What features does your practice or provider need in management software? Scheduling, electronic billing, ERA support, custom reports, electronic documentation? Therabill supports all of these! Overall: Overall, I am thrilled with this program/service! You really want someone who cares about making their product the best, and who is responsive to your needs. If a suggestion is something that might suit a reasonable number of other users, it is usually implemented. It is very easy to exchange emails with someone who is so quick to respond. 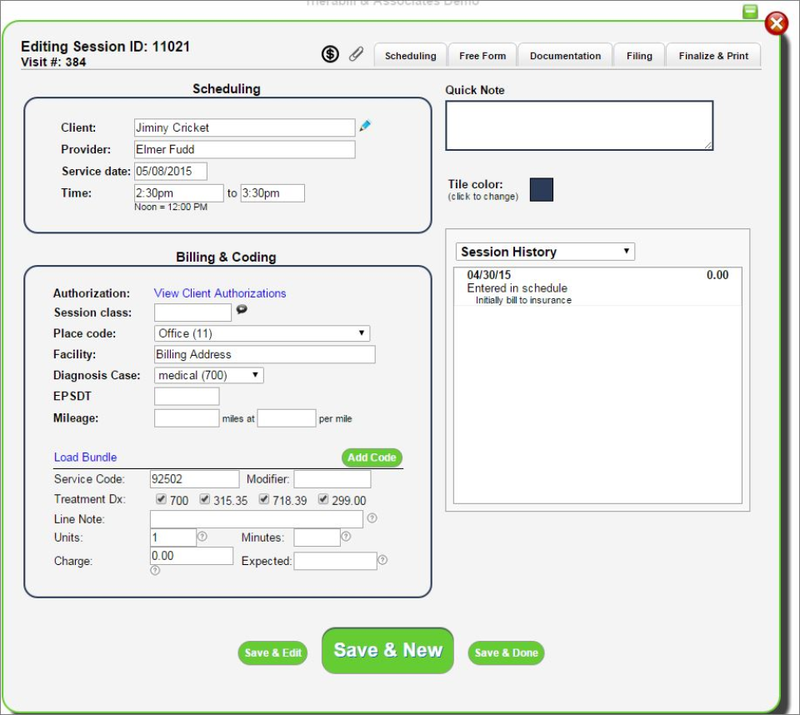 And, the billing/scheduling in one is both cost effective and also helps to ensure that a session is not missed. Really, I am very pleased! Comments: This product has been extremely helpful in reducing time spent on insurance invoicing and reviewing EOBs. It also provides professional looking invoices. I love how it keeps track of how many days have passed with overdue bills. 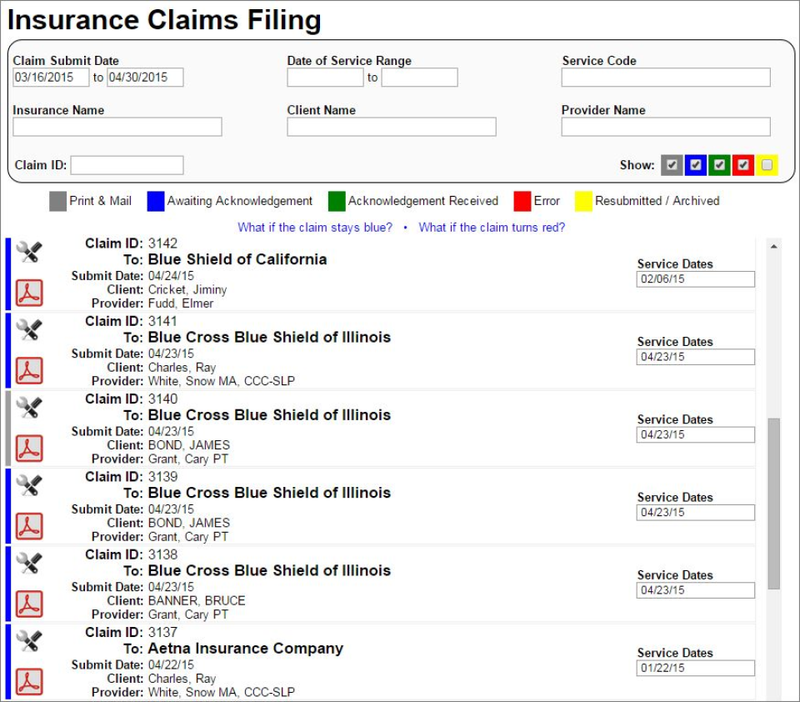 Pros: Within a few clicks I am able to submit claims to insurance companies. I don't have to spend time double checking each box in the claims submitted, because they are always filled out automatically correct. Cons: Some features with finding bills and payment receipts required assistance for me to find when I was initially learning the program. Comments: I'm a speech-language pathologist and a sole proprietor. I have around 10 clients that I see privately in addition to working for another agency. Before Therabill, I was keeping track of everything by pen and paper along with Google calendar. Therabill is great because it has all the features I was looking for in one product. I've been using it for a year now and can't say enough great things about it! I can submit all of my insurance claims through here. It keeps electronic files for my clients (current and discharged) where I can write daily SOAP notes and upload evaluation reports that I've written on Microsoft Word. 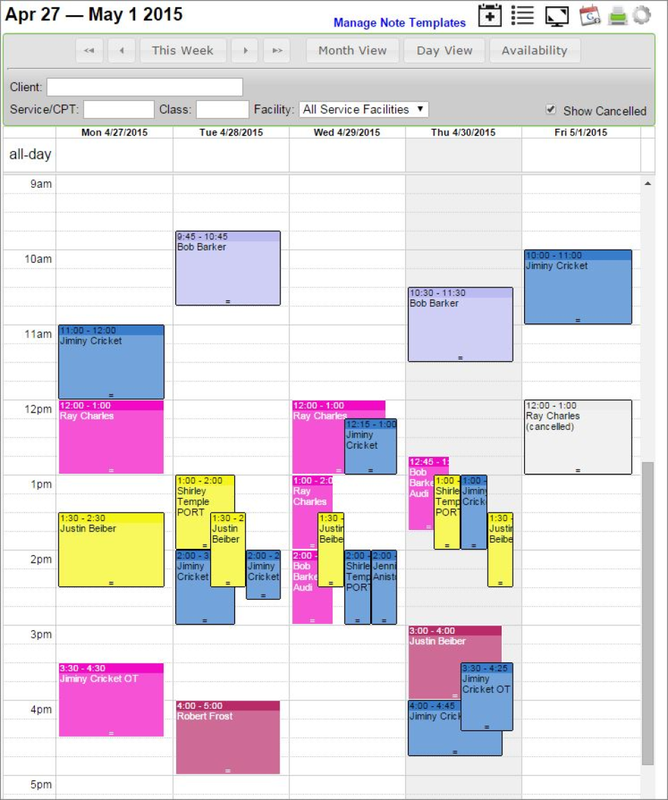 The calendar syncs with Google calendars and helps keep track of my sessions with clients, lets me add in other events (I add in the clients from my other job onto the calendar so I don't double book), and automatically sends email reminders to clients about their upcoming appointments. It's very user-friendly and all web-based so you can access it anywhere you have an internet connection. Customer support has always promptly responded to my emails and questions and fixed any problems within 24 hours. The online help videos and webinars are actually helpful and worth the time to learn about all of the features that Therabill has to offer. I highly recommend this product for any allied health care professional to help keep their billing and medical records organized and easily accessible. Comments: I would recommend this software. Once you get used to all of the tabs it is very functional. Pros: All the billing is in one place and I can edit patient information in the program without going in to another program. Cons: The program is a little hard to navigate at first (as with any new software) but the flow seemed hard to get used to. But now it is great. Pros: User friendly/easy to use; excellent customer support. Great from the "billing submission" perspective. Cons: Difficult for an inexperienced person to decide on which reports to generate, when and how often. Could use a "user guide" with examples of sample reports and how to generate them. No option to reconcile payments due to providers based receipt of payment separate from ERA/EOB- assumes that payment is received with the ERA/EOB. Overall: Would definitely recommend this for an individual provider or a small agency. Thanks for the useful feedback. I would like to respond. I do not feel it would be wise for Therabill to dictate when, how often, or even if you should create reports. Therabill caters to a large audience, from solo providers to groups over of 100 providers. There are some commonly needed pre-made reports if you need them under Filing -> Reports. In addition to the commonly used pre-made reports, I will put up some report examples from the customized reports. Therabill does give you the ability to enter a "Deposit Date" with each of your payments entered. This could be used to reconcile your payments. Pros: I am a counselor in private practice and cannot recommend Therabill highly enough! I had not previously done electronic billing and am thrilled to discover how easy it is with Therabill. Therabill is very easy to use, very intuitive and simple. Therabill has the best technical support on the planet! All of my questions are answered very promptly and clearly. Therabill staff are also open to my suggestions for improvement. My life has truly changed as a result of this product. It is so easy to use for scheduling and billing, and at the tail end of the billing process it seamlessly enters payments and adjustments from the insurance companies into my clients' accounts. Creating statements is also easy. Therabill also allows for charting, and while I have not used this feature, I'm sure it is first-rate as well. Therabill is an attractive program that is easy to use and has saved me a lot of time and money. Well worth the monthly fee! Cons: I cannot find any downside to this product. Overall: Outstanding product with amazing customer support. A great value! No hassle scheduling and billing. Pros: It is easy to use and navigate through. It has continued to grow since we began using it in 2012. The vendor is always wanting to make it more user friendly and tailoring it to everyone's needs. Cons: What I like the least about this product is that it went through a period when it was always running slow. Once Therabill realized there was an issue with too many users, they expanded to benefit the customer and their needs. Recommendations to other buyers: At this time I do not have any recommendations for others when it comes to evaluating software. Pros: The system is fairly intuitive and user friendly. We've used it sporadically for the first couple months but are now using it more consistently and getting better acquainted. The processes are fairly fluid and easy to remember unless you make some manual entry errors. Cons: Front end training was pretty minimal. Sometimes customer service can lag but they're generally responsive & willing to take time to work through things with you on the phone. If you make manual entry errors it can take several steps with customer service guidance to get things cleaned up. Cons: When you make a mistake, it can be complicated to figure out what to do to fix it and sometimes the call back support can take a while to get back to you. Comments: I am single business owner with a private psychotherapy practice. I was looking for an affordable billing system that was simple to use and I could access from any computer. I contacted several billing companies who had extraordinary start up fees and extra fees for claim submissions over a specific number. I finally came across Therabill and tried the demo which seemed easy enough. I requested a call to get further information, heard from them within an hour, and was quickly sold by the no set up fee and low cost. I have been with Therabill for over a year and it is by far the best business investment I have made thus far. I've enjoyed the improvements along the way, and have benefited from them as well. I've referred colleagues and they too enjoy the functionality of Therabill. Customer service is stellar! If I am having any navigating issues, they are addressed quickly. I am provided with a step-by-step guide to address my issue. I do like that I have the option to search for a how-to video as well. Also, issues are not only addressed in writing, but verbally if needed. I highly recommend Therabill. I look forward to more improvements that will decrease the stressors of billing. Pros: You can use it anywhere; at home in the clinic or on the go. It is very simple to use; and customer service is fantastic. They reply fast to all inquiries. I love the goal bank; once you have written a goal you can find it and edit it easily to use for another kid. Cons: Just wish it wasn't as expensive, compared to other's. Recommendations to other buyers: It is a bit more pricey than other software; but it really has everything you need. Comments: When this was a stand alone independent company, you could get prompt responses to concerns, reasonable and frequent updates. There is zero care about behavioral health support at this point. Don''t do it. There are better programs out there and to switch is a huge burden. Pros: It had been a fairly comprehensive billing and documentation software. Before it was purchased by WebPT, the updates were frequent and helpful. This is now non-existstent. Cons: Frequent outages with PAID text reminders not being sent because the developers didn't create enough memory, no real updates of importance or frequency. Awkward user interface. Therabill billing website is the best out there. Pros: Therabill website gives me the ability to bill insurance companies for services provided, keep track of what has been paid, print out statements for clients who pay out-of-pocket, schedule appointments, write client notes and many other things that I have not yet explored. Therabill offers technical support like no other site. The IT guy will get back to me within 15-30 minutes if I have a question or problem. They go above and beyond and they truly care about the people who use the website. They are continually updating the site and adding improvements and new options. You can't go wrong with this web site, it makes billing a pleasure. Therapists who work for me find it very beneficial for maintaining their schedules, and it was easy to train them on how to use the website. Cons: No cons, that I have found. Overall: I would recommend Therabill to anyone who needs to bill insurance companies for services. Comments: I have a small Physical Therapy practice that had been overwhelming my life with paperwork! I had been using a server-based documentation system that produced a charge list that had to be transferred to a billing system. I was desperate for more efficiency and more free time! I stumbled across Therabill in my search for a software system that was simple, but able to incorporate documentation and billing. Therabill is a fantastic product that maximizes your efficiency by simply allowing you to schedule a visit, enter your documentation, and complete billing from one basic interface. It all happens together, very intuitive! The monthly cost is extremely affordable. Electronic claims are submitted without an additional charge. The most challenging but exciting aspect of Therabill is the documentation. You actually create your own forms by adding or removing fields. It takes a little time but you can achieve the format that works best for your practice. You can also build databases as you type. Best thing of all, if you run into a problem just pick up the phone or send an email. You get almost immediate resolution. Thanks Therabill! Comments: We are a relatively new physical therapy clinic and have used Therabill for the past 7 months for documentation and electronic insurance claims. We recently transferred our credit card processing system from Century Connect to Therabill as well because we were having a lot of technical issues with Century Connect. We also wanted to streamline our company and save on time. We have been so impressed with Joe and the team at Therabill. From day 1, they have been incredibly fast at addressing any questions we have had regarding their system. It usually takes them minutes to respond to an email and there is always someone we can talk to on the phone if need be. This past week, we noticed an issue with client's not receiving emails for charges being made through Therabill. It took Therabill 3 days to add this new feature to their system. 3 days! They made our case a priority and took our recommendations very seriously. We appreciate Therabill so much and would highly recommend them to any therapist who is opening their business OR who is with another company that doesn't provide personalized service. Pros: Therabill is a life saver! I was doing my own billing and spending hours, with mountains of paperwork. Then my friend showed me Therabill - it was user friendly, efficient and time-saving, and Joe is a great support if you are having problems. I got control of my billing and it only took minutes a week. It was affordable too! Cons: I am not doing billing anymore (I work in a school) but I still have to pay monthly to keep my bookkeeping for tax purposes. Overall: Awesome awesome awesome! I have recommended therabill to several others! Therabill does not hold on to your private client information if you do not have a paid account with Therabill. However, at any time you can do a full download of all of your information to your computer if you no longer want to subscribe to Therabill. Therabill does offer the option to hold on to your information for you and give you access to your account for a very minimal monthly fee of $6.95 per month. Pros: I started using Therabill about 1 and half months ago and I have been very pleased with the product. Prior to using Therabill, I used a billing specialist. She just did my billing, not my bookeeping and it cost me more. Therabill is a very effective way to manage your billing and easily bill. I bill insurance companies direcetly as well as CBO for Early Intervention. I also use Therabill to bill my clients directly. Cons: LIke any program, you need to be pro-active about entering the information. You also need to take a little time to watch the very helpful videos. However, if you have questions, customer support is great! Overall: I would recommend Therabill if you need a program that does both your billing and bookkeeping. It is a user-friendly program that helps you track billing as well as bill. Pros: Customer support is great. I have never had such great customer support. Before TheraBill it would take me hours a week to bill insurance companies. With TheraBill, I spend about 5-10 minutes per night. It sends my insurance claims electronically and I get payment much much faster from the insurance companies. I looked around at other software and they wanted in the range of $75.00 - $150.00 per month. Some would even charge per claim fee's on top of that. As an individual therapist, I pay $24.95 per month... with no other fees. Cons: I can't think of any cons at this moment. Overall: If you are a therapist doing your own billing, I HIGHLY recommend that you try TheraBill. If you are paying a billing service to do your billing, I HIGHLY recommend that you try TheraBill. You can do it yourself and save yourself the cost of a billing service. Pros: The main dashboard page offers a lot of information. Especially helpful is the box that will show any electronic EOB's that have been rejected. Cons: This product is not user friendly. There are a lot of tabs that are not needed or applicable. When looking for something that should be obvious, it is not easy to find. For example, to apply payments to a patient account, you would click payments->enter payment->batch client. Therabill could improve their user friendliness by using terms that match to the task. Pros: I like the support online and the quick response time to individual problems and or concerns. Also, features are developed in response to requests. Cons: It lacks intuitiveness so that I am searching all over and then after I found how to do something I cannot remember how I did it. Recommendations to other buyers: Look to see if the product syncs to calendars you are using outside the software and if it allows for documentation, scheduling, and billing. The people at Therabill are incredible! Pros: They have incredible customer service! When we signed up with them, we were on the phone several times a day. Their representatives knew us by names and were always courteous and extremely helpful. And there were no wait time to talk to a human being - never! I also like how intuitive the software is for a therapist to use; there are several things that we are still learning, but everything works for our small practice so far. Cons: Nothing really. They listen to suggestions and always try to find best way to answer your inquiry. Figuring out the financial reports was a bit tricky, but this is more because we are therapists not accountants. Still, there are a few things in the reports I would like to change like calculating payments coming from different sources in order to pay biller vs therapists. Recommendations to other buyers: It is a very user-friendly software with incredible customer service.It's very good for small practice. We switched from Kareo to Therabill and the customer service at Therabill is non- existent. They cannot transfer you to another person in the other department as the building is next door. Comments: I am surprised that WebPT is putting this product our an advantage as it is more labour intensive. We have had the same biller for 13 years and 3 different billing systems and very flexible - she doe not like the feature of therabill at all. Pros: There were supposed to be improved management reports and features that we are yet to find, as the folks at therabill cannot even help us find that which they are advertising as a benefit. Cons: We have Zirmed as a clearing house which was supposed to be compatible with Therabill. It is not, whenever, Therabill changes something in their program, Zitmed is not updated. The result being that when we had Kareo the previous billing system compatible with WebPT, our bills were automatically sent out by the clearing house, the click of a button. We have been hand folding - sent 470 accounts out yesterday and everyone was folding and stuffing statements due to this glitch. I recommend WEBPT as and EMR but highly discourage you to go with Therabill. Pros: Once the product is set up and you figure it out, it works fine and consistently. It is easy to apply payments. Cons: This product, while effective, is NOT user friendly. It is not intuitive whatsoever, so it does take some time to figure out how to do things. Lives up to it's claims! Comments: Simply AMAZING. If you are looking for a web-based software to take care of ALL your medical practice needs this is the one for you. Due to the ease of use and constant improvements I don't need an office assistant to help me manage my business. Joe and his team manage it for me. I am amazed at the rate that new and innovative features are added with a support video to help you implement the new feature. I hear the same comment over and over from colleagues .." I wish I had found it sooner...it has made me more efficient and effective". While a "great" review would include pros and cons.......I honestly have no cons. The price is unheard of for what you get, the support is quick, the product is professional, clear, and extremely user friendly, and it truly helps your bottom line! Comments: For years I have been using a different practice management product that required I export to a claims processing service. Recently I decided to look for a product that was web-based and would include the billing feature without exporting. I researched and selected a different product to begin using the last week in August with the plan of discontinuing the old system at the first week in September. Well, after 4 days with that product, I began looking again and found Therabill. Within 3 days we were up and running because the software is intuitive and has great video training support as well. Besides the ease of use, it is incredibly flexible. Lack of flexibility was why I aborted on the first program I selected. We are still in the free trial period and love it! Pros: Therabill completely meets my needs at this time. It has facilitated the whole billing process for me, and significantly reduced the length of time I spend processing payments, invoices, etc. All with a click here and a click there, everything is done. Cons: Initially, it is a bit confusing on how to navigate around all the features, but Joe is ALWAYS prompt and efficient in providing responses to customer inquiries. Furthermore, he added specific feaures to the program upon request to meet my specific needs to facilitate my billing. Overall: I have recommended Therabill to a number of colleagues. I highly recommend this program. Pros: I like the integrated capacity of this software. All aspects of the software work nicely together, to support my practice. Recommendations to other buyers: Unless a newer, more iPad-friendly version is created, this system is great for non i-Pad systems. It's a truly excellent program. Comments: I have had a private practice for 6 years and have outsourced my billing. We decided to attempt to bring our billing in house, and Therabill has made the transition successful. The product is intuitive and user friendly. 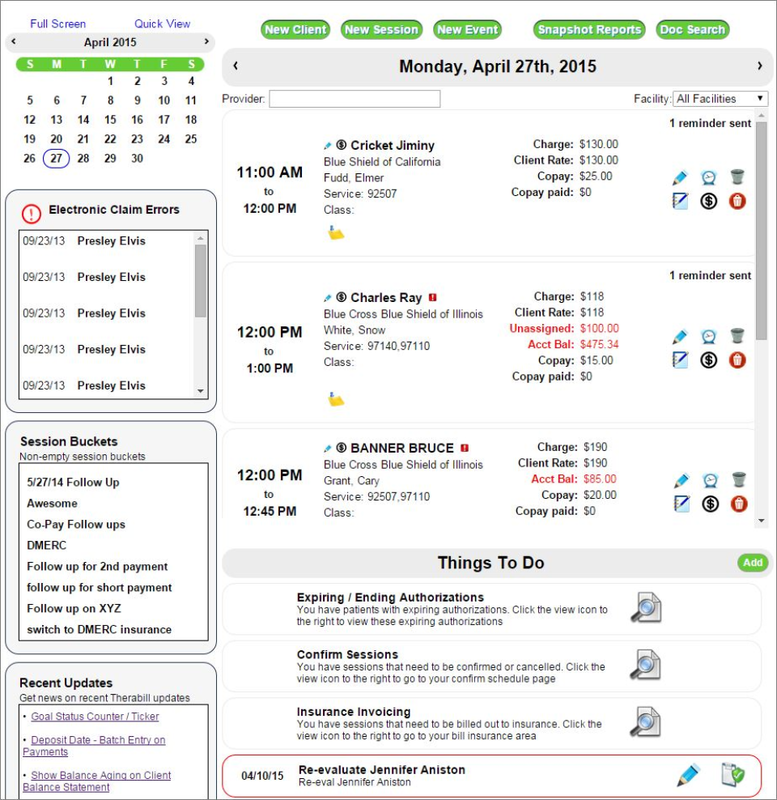 We love that it incorporates all aspects of our jobs; scheduling, data base, billing and reminder calls. We are looking forward to learning more about the documentation features that are available. The tutorials are comprehensive and helpful. The staff have been more than helpful and caring with questions about our set-up. One more benefit to using Therabill is the amount of time our clinicians and front office staff are saving with the seamless functionality of the program. Thanks for a great product!! 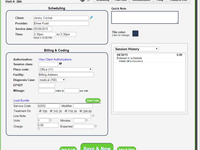 Pros: - Fully featured billing and practice management system. - With frequent updates and maintenance, Therabill just keeps getting better. - A+ customer support. E-mails are frequently answered with in an hour or less. - Easy import and transition from old software. Overall: Our practice was looking for an all in one, billing/ scheduling/ practice management system. We currently have 12 providers and plan on continuing to grow. We found Therabill and liked it immediately. After the demonstration that Joe gave us, we only liked it more. It is affordable and feature rich, and has everything that we were looking for. Pros: Clarity of process - we were walked through step by step, with the option of asking for help at any step of the way. Cons: I do not have any negative issues. Overall: I would recommend Therabill to any provider just beginning a practice, as we were, as well as to an existing provider looking for a more concise form of record keeping and billing. Therabill: Easy to Use and Stellar Customer Support! Pros: Easy to use; responsive customer support; documentation feature; very reasonably priced. Cons: No cons encountered to date! Overall: I recently started a private practice in Speech-Language Pathology, & a colleague recommended I give Therabill billing software a try. I have been very pleased that I did! Therabill is easy to use, and their customer support is outstanding! Joe Dundas and his team are always quick to answer my questions when they arise. Their quick answers (often to questions I didn't even know I needed to ask) have saved me hours of time and frustration as I navigate new territory. And what is even better is that I have produced clean claims and have been paid! Pros: Great customer support and training for new business owners. Easy to use software with great self training modules. Cons: Sometimes it may take few days to schedule training's because customer supports are busy. However when the support is available they are very helpful. It has gone remarkably well. We love it! Cons: The payments piece is somewhat awkward, especially since we offer a sliding scale to a third of our clients. Recommendations to other buyers: Try it and see! We've found the support to be very helpful. Even before we signed on to use the product, they were available to answer all our questions with regard to how the program runs. Pros: Their customer service is the best. The ease of charting, billing, and tracking is amazing. I have used Therabill for five years and love that they are constantly improving their system for more efficient use. Cons: I have very few complaints. Toggling between the billing desk and client chart could be easier, but it's not much work as it is. Recommendations to other buyers: For private practices and small counseling offices, this product is a perfect fit. It is affordable, and customer service is so good that they are willing to talk you through any problem. Pros: I love how it is interconnected with my webpt software and makes billing easy with the click of a button. Cons: My Medicare ERA does not automatically get put in therabill. I have to do it manually by hand which is time consuming. Pros: Wonderful product for all therapists and billing specialists. I am a therapist who knew next to nothing about billing when I started. Not only did Therabill help walk me through getting the billing completed, but I've actually learned quite a lot about the billing process as well. New features are continuously being added. I'm very thankful for the person that turned my attention to Therabill when I started working independently. Cons: None for our use. Overall: I would highly recommend this program. I am so glad someone recommended TheraBill to us. When we first started with the program and needed assistance, our calls were returned promptly. The office assistant using the program was somewhat inexperienced in computer use but found this program to be user-friendly. And even after using the program for almost 2 years, if we ever need support (which is very rarely because of the ease in using TherBill), our emails are answered very quickly. Pros: I am an independent therapist with a small private practice. I have been using Therabill for many years. It is simple to imput your client information and get started. It allows you to easily bill insurance companies and early intervention. Therabill is extremely user friendly and has excellent customer service. Cons: I have had a very positive experience using Therabill. 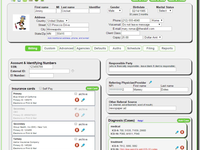 Overall: I would highly reccomend Therabill to handle medical billing for a small practice. Therabill has cut down on my paperwork time. Pros: The best part about this product are the billing features. It makes doing my own billing simple, fast and efficient. Also, the staff at Therabill have been easy to contact and have attempted to work with me to customize the program to my individual needs. 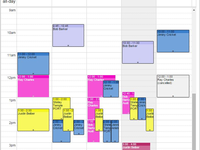 Cons: My least favorite feature is the schedule/calendar. Recommendations to other buyers: Use the 30 day free trial to determine if Therabill meets your needs. Also take advantage of the free training.